I've heard the term STEM being thrown around quite a lot over the past couple of years. I knew it stood for Science Technology Engineering and Math. And that's about all I knew. So I started researching a bit more and found that it wasn't some big, abstract, scary thing. 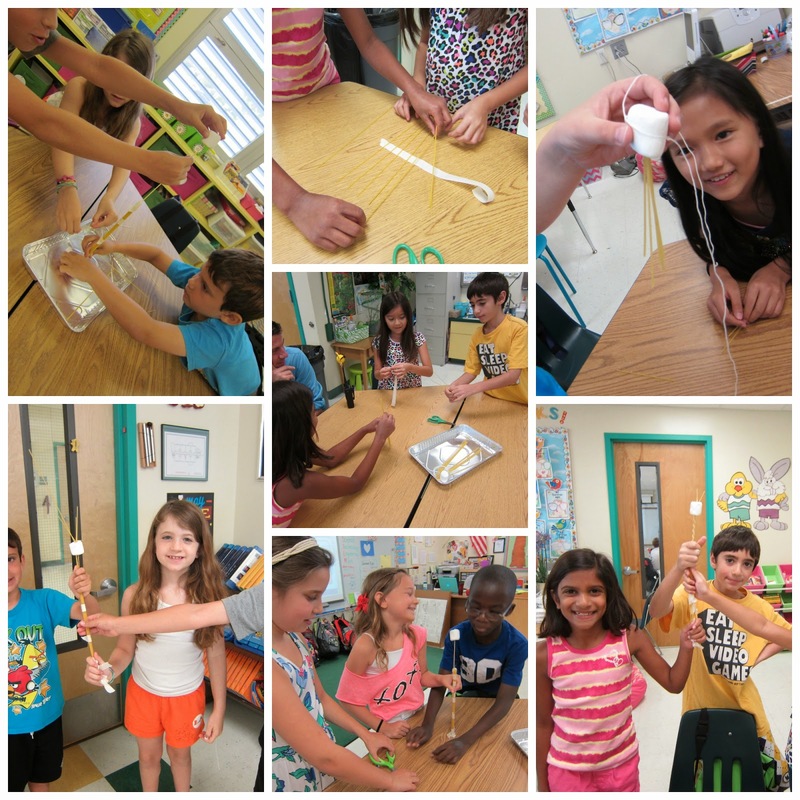 It's actually a completely doable, fun way for your kids to experiment, collaborate, and problem solve. 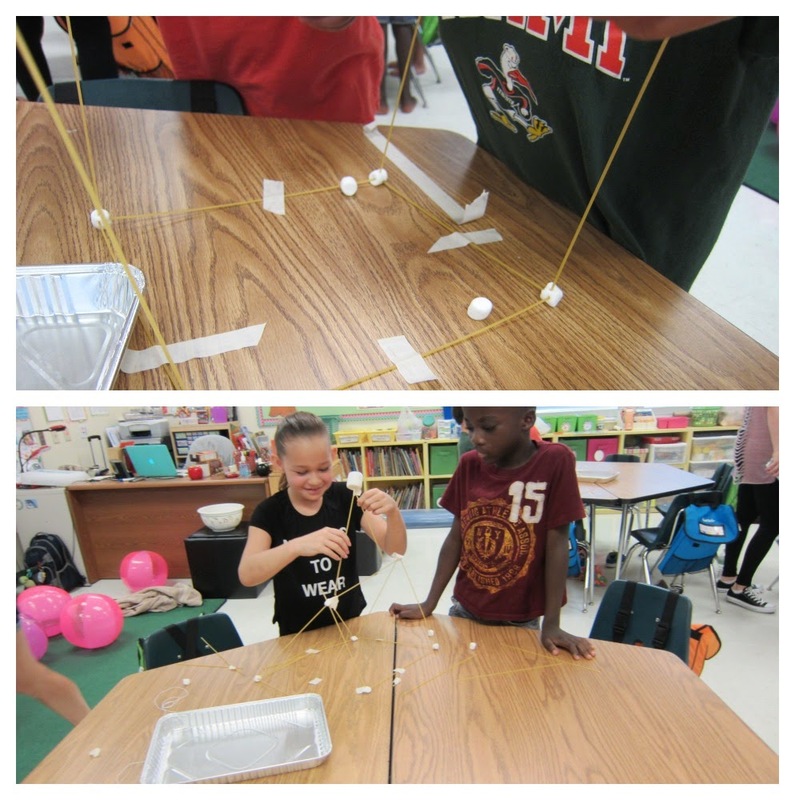 One of the most popular challenges is the Spaghetti Tower (sometimes called Marshmallow Tower) challenge. In fact, there's a whole website devoted to it, including a really, really interesting TED talk. All you need for this one are some basic supplies. I put them each in a tin tray just so that I could prepare them ahead of time and have it all ready to go. The tape is the only tricky one. I measured out a yard and stuck it lightly on each table. The kids just ripped or cut off what they wanted as they needed it. You can click here download the document you see below. It's as simple as that! They can do whatever they want with the supplies they are given, but they can't get any additional supplies. So if they turn all of their tape into an unusable bundle, they have to figure out a solution. 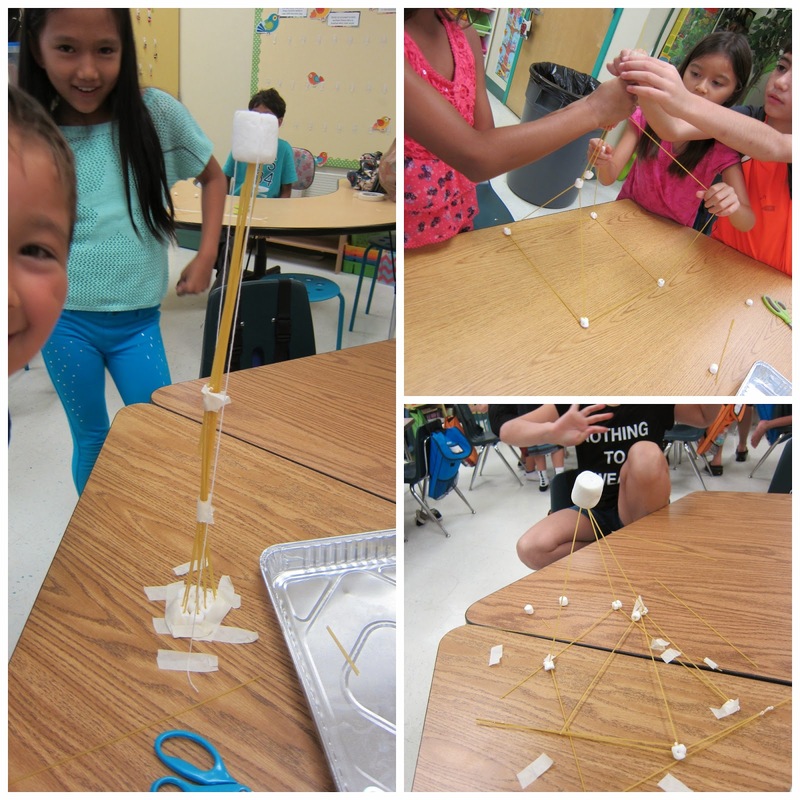 The only rule is that the structure must be free standing at the end of the challenge and the marshmallow has to be supported on top. If your kids crave rules and directions like mine, this will be tough. They wanted to ask a million "what if' and "can we" questions. That in itself was a great challenge for them to overcome. They get 18 minutes, which can either feel like an eternity or the blink of an eye depending on how effective the team collaborates together. I used this online stopwatch and projected it on the board so they could always see where they were with time. I was calling out time checks for them, but they were not a fan, so I just let the timer do its thing. At the end of the challenge, we only had two standing towers. They all tried to basically do the same thing and stick all the strands of spaghetti to the table somehow. Finally one group thought about how to use the string to secure it. I was really rather shocked at their results. I didn't see a lot of risk taking or experimenting. It made me realize just how important these types of challenges and explorations are. So after we were done, we talked about what went right and what went wrong. We talked about other things they could try. I asked them what supply they thought was most important and which one they would double if they could. Most importantly, I asked them if they wanted to try it again - and the answer was a resounding YES! So the next day, we tried it again. But this time we had an additional supply - ten mini-marshmallows. The addition of this new supply combined with their previous experience really amped things up! This simple activity was so amazing to watch unfold. They had to call on so many different general skills and principles and they had to do it together, which is a big focus at our school. I thought I would be impressed by their efforts on the first day, but I really wasn't. I'm so glad I gave them a second chance, because the growth and risk-taking increased dramatically over just one day. 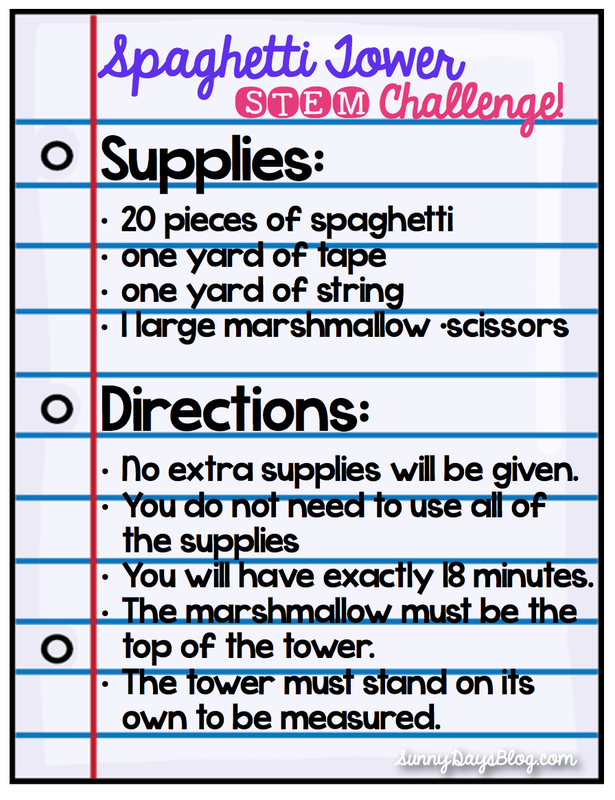 Imagine what it will be like next year when my kids get to participate in a challenge like this every week! I'm determined to make this a focus in my room next year. I've been collecting some ideas on a new Pinterest board if you want to follow along. Just click HERE. Love your post! Love the idea. Like yourself, I have seen and heard STEM being thrown around and often feared from it. You have inspired me to give it a shot this year. Thanks Sara! I'm so glad I finally took the plunge and researched it a bit more. There's always so much to do that it's hard to find the time - but this was so worth it! I'm so intrigued by al this STEM talk- sounds like it was a great activity for your students. Excited to see what else you do next school year! Definitely following that pinterest board of yours now too- thanks! 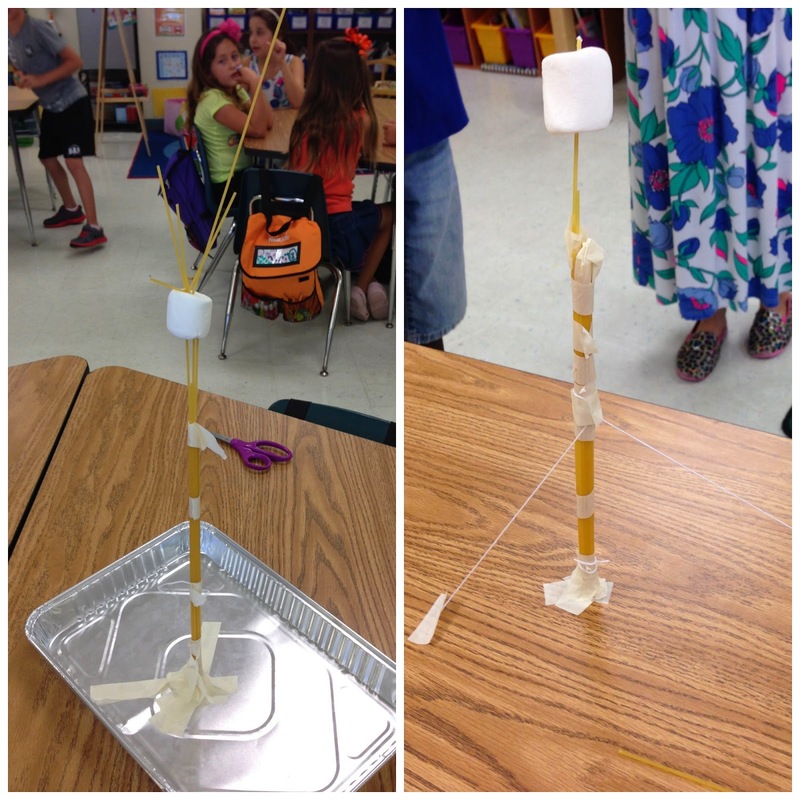 Oooooh I can't wait to try this and more with my 2nd graders next year! I wish I'd done this with my class this year... I know they would have gotten a kick out of it. Thanks so much for sharing this! Yeah, I really wish I started earlier with my class this year, but there's always next year! I think finding and trying new things is what keeps life interesting, right? I liked reading your post. I recently blogged about a state conference I went to, and a teacher friend that went with me attended a STEM break-out session. She shared a great website with me. Maybe it's one you would be interested in: Children's Engineering. It was some ready-made plans for teachers to implement. It looks very interesting and I am excited to try some of their ideas in my second grade classroom too! I love this! This simple activity can be adapted to reach so MANY different grade levels and ability levels. I will be in seventh grade science and I will definitely be looking for more STEM ideas to reach cross curricular. Love this! Thanks for sharing! Love this! It makes a great team building activity. I love how the students were able to do it again, with a "twist". The immediate ability to alter their process is great. Doing it again the next day was definitely the best part of the whole thing for me. I'm so excited to see what next year brings! This was awesome to read! I will be teaching second grade for the first time since I was a student teacher 15 years ago and I am so so so so excited! This is by far my favorite grade! Do you have a blog post about your daily schedule? I am trying to find a way to make sure I get as much into each day as I can! Thanks Denise! Now that summer is here, I'm getting back into reading blogs. I always love reading yours! Patty! I love when I see you've commented on something of mine. Love that the summer gives us time to get back to blogging! I love this idea! Pinning! I LOVE doing STEM education in the classroom! I did it a lot this year. It's amazing to watch kids work together and have their brain work differently. I have never done this activity so I will need to check it out. I am doing a giveaway on my blog and would love to have you check it out! I am giving away a month subscription to The Teacher Kit! Check it out! Thanks, tucking this one away. Our school is adopting the formal STEM program next year. We served as a pilot for the program this past spring and it was terrific. There is even talk we may actually go with STEAM (adding art). So we will see...tucking this away to supplement whatever program our district puts in! Oh wow, Suzy - that sounds really cool! Unlike some of the fads that come and go in education I think STEM and STEAM really make a lot of sense! I love this process! I really like that they learn from the first attempt and go back and try again with their new found knowledge! Like Patty above, I'm enjoying summertime's opportunity to read favorite blog posts! Great idea!! If you use Donors Choose, check out their project matching page. There is a special incentive for STEM projects. I believe they will match half the cost. I absolutely LOVE this! We don't get much time to teach separate science/social studies concepts in our class - it is all integrated into reading. We do have 20 minutes each day though and these activities would be perfect! 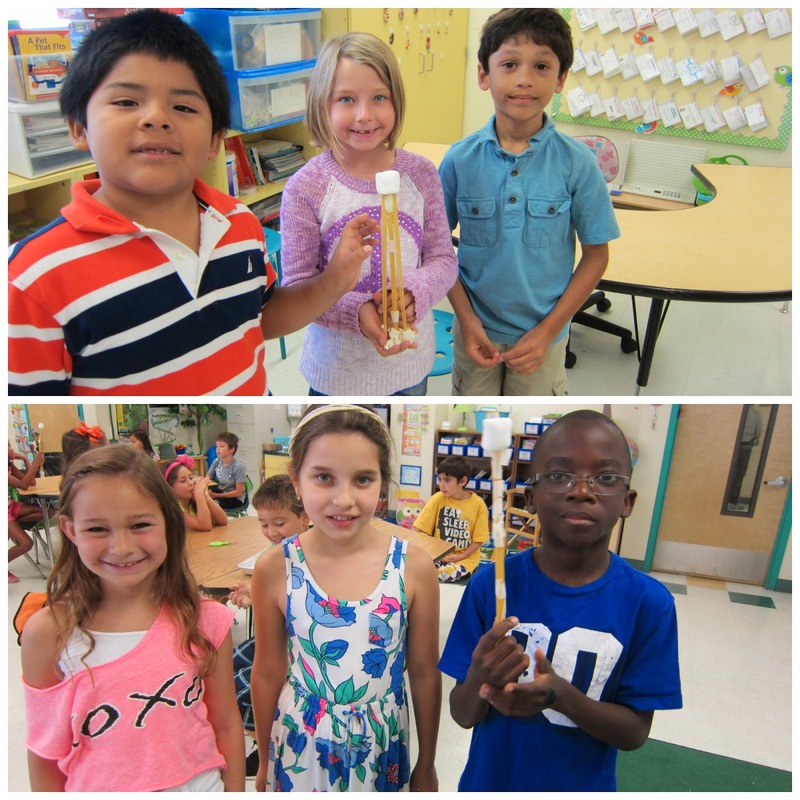 We did one STEM activity last year - building a house for the fourth little pig - and my students said it was their favorite thing we did all year! 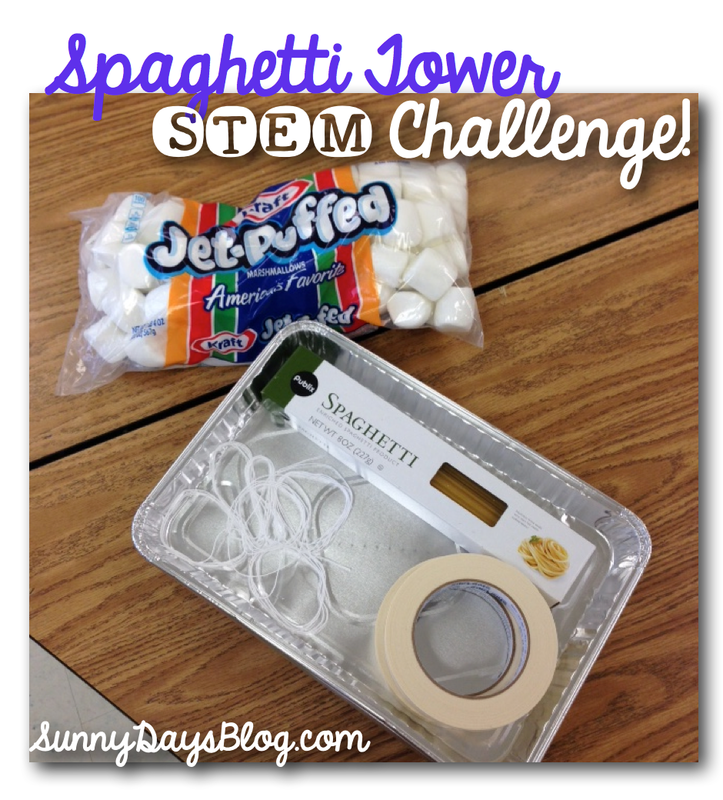 I love the idea of doing a STEM challenge once a week. Especially since we don't always have time for full science and social studies units. I would like to do this as a library program. What age group do you suggest? Thank you so much! I will try this in my 2nd grade room this fall! I also am collecting ideas for STEM for next year! I will definitely be following u! My first graders (soon to be second graders) had a blast with this! Thanks for sharing!!! Tips to Trash the Treasure Box!